passion and intellect shared here each week. Comparative texts about Spirit Possession and Exorcism from Philo, Lucian, Josephus, the Babylonian Talmud, Midrash, Philostratus, etc. At (Rutgers University Dept of Religion) Mahlon H. Smith's Into His Own: Perspective on the World of Jesus companion to the historical study of Christian texts. "Kingdom and Repentance," "John Baptizes Jesus," The Jesus Database, an online annotated inventory of the traditions concerning the life and teachings of Jesus. Dr. Gregory C. Jenks, FaithFutures Foundation. IV, 43-44; V, 43; Tatian's Diatessaron (c. 150-160). III.24, Ecclesiastical History, Eusebius of Caesarea (c 320). "'Driveth' here does not refer to something violent and forcible: but the divine power clothes Christ (who had lived until this time as a private man) with a new person, and prepares him for the battle that was at hand, and for his ministry." "The serpent tempted the first Adam in the garden, the Second Adam in the wilderness; with different success indeed; and ever since he still tempts the children of both, in all places and conditions." "So in all the children of God, extraordinary manifestations of his favour are wont to be followed by extraordinary temptations." The Repentance of Believers (Mark 1:15), The Way of the Kingdom (Mark 1:15). Sermons by John Wesley. "...supposing we do thus repent, then are we called to "believe the gospel." And this also is to be understood in a peculiar sense, different from that wherein we believed in order to justification." "The repentance which is here commanded is the result of faith; it is born at the same time with faith?they are twins, and to say which is the elder-born passes my knowledge." Commentary, Mark 1:9-15, Matt Skinner, Preaching This Week, WorkingPreacher.org, 2015. "With Satan having been confronted and perhaps served notice by the Spirit-possessed Jesus, with wild animals having been made unwilling or unable to prey on the vulnerable, and with John's public ministry having been terminated by a reckless and arrogant puppet king, now the time is right." "Wilderness Faith," David Lose, ...in the Meantime, 2015. "I wonder if we can look at the struggles around us in light of this story and ask, 'Even though I did not wish for this, how might God be at work through this difficult period. What can I get out of this? How might God use me to help someone else?'" Sermon Starter of the Week, illustrations, text commentary, etc, Scott Hoezee, Center for Excellence in Preaching, 2015. "...here is an early indication in the gospels that where Jesus will go, somehow shalom will follow." "The Greatest Temptation," Karoline Lewis, Dear Working Preacher, 2015. "To preach the temptation of Jesus in Mark is to call attention to our greatest temptation -- the temptation to think that God is not present." "The Beloved Tested Son," D Mark Davis, Left Behind and Loving It, 2015. "Christologically, this pericope combines the baptism and the testing in the wilderness. The beloved son is the sone who is tested." "Jump Starting Lent," David Sellery, Episcopal Cafe, 2015. "These are precious days. Let's not waste them. Repent. Banish hatred and rejoice in the relief that brings. For the next forty days let's live his kingdom." "Lenten Transformation," Melissa Bane Sevier, Contemplative Viewfinder, 2015. "We get into habits, even spiritual habits, that become rote. Change is good for the mind, good for the soul." "And he was with the wild beasts," poetry, Andrew King, A Poetic Kind of Place, 2015. "More Than Enough in Wilderness Times," Janet H. Hunt, Dancing with the Word, 2015. "Jesus is, of course, the best guide and companion we can hope to have. I have offered the example of the faith and witness of Kayla Mueller in her wilderness. What other examples would you offer?" Visions from the Catacombs, February 22, 2015. "There are many temptations that come from public leadership on an issue. Some of these are external temptations. Some of them are internal to our own families and our own selves." "Hardest Words," Alan Brehm, The Waking Dreamer, 2015. "The repentance that opens our hearts to the healing and loving presence of God begins with saying 'It's my fault.' But repentance that leads to real transformation goes beyond that: it means choosing not to continue pursuing the selfish ways of this broken world." "Jesus and Siddhartha: The Temptation to Give Up," Bob Stuhlmann, Stories from a Priestly Life, 2015. "One has to be able to control one's fears, including fear of failure, inadequacy, or conversely pride and hubris." "Stage Right!" Thomas Beam, 2015. "Stop Repenting and Start Changing!" Bruce Maples, 2015. "Into the Wilderness," Lynn Miller, Art & Faith Matters, celebrating our creative and living God by generating art and architecture resources for congregations and individuals. Art and Faith Matters facebook page contains additional resources. "Home in the Wilderness at Last," Andrew Prior, One Man's Web, 2015. "The wilderness is never tamed." Commentary, Mark 1:9-15, Sarah Henrich, Preaching This Week, WorkingPreacher.org, 2012. "The loneliness of God's servant, a theme that persists throughout the gospel, is already suggested in these verses. " "Beginnings and endings," David Lose, Dear Working Preacher, 2012. "This passage reminds us that Jesus came into darkness and violence precisely in order to be joined to our brokenness and to redeem it." "The Pleasure Principle," Stephanie Buckhaon Crowder, ON Scripture, Odyssey Networks, 2012. "The real pleasure principle is not a cycle of doing and getting and doing and getting to feed hubris and ego but where we are silent and still." "The Spirit at Baptism: From Dove to Harpy!" D Mark Davis, Left Behind and Loving It, 2012. Holy Textures, Understanding the Bible in its own time and in ours, Mark 1:9-15, David Ewart, 2012. "Believe in the good news" is better translated as 'Trust into the good news,' since the whole point is not, 'Have an opinion about the good news.' Rather, Jesus is calling for a radical, total, unqualified basing of one's life on his good news." "John the Baptist, Jesus, Satan, and You," Alyce McKenzie, Edgy Exegesis, Patheos, 2012. "Sometimes life thrusts us into a wilderness where we are both tested and strengthened." "Baptismal Urgency," Rick Morley, 2012. "Lectionary Blogging," John Petty, Progressive Involvement, 2012. "For Mark, to turn (metanoeite) means to turn from the established order of the worldly political powers with their heirarchy and cultural division, and trust (pisteuete) Jesus who leads the way into a future of reconciliation and equality." "Life through Death," Andrew Prior, First Impressions, 2012. "We only believe when we are living a life of repentance by living with compassion for others, instead of living for ourselves, trying to stave off our own dying." "Wild Beasts and Angels," Melissa Bane Sevier, Contemplative Viewfinder, 2012. "...when you find you are in the presence of the wild beasts of your fears, may you also discover that the angels are your companions." "What Happens in Baptism..." Danielle Shroyer, The Hardest Question, 2012. "Baggy Trousers," Neil Chappell, a weird thing, 2012. "What Happens to Those God Loves?" Carl Gregg, Patheos, 2012. "In the Gospel according to Mark, it seems that the Spirit drove Jesus into the desert as a time of preparation." "Uncharted Territory," Janet H. Hunt, Dancing with the Word, 2012. "How do you understand the Spirit driving Jesus or any one of us into the wilderness?" "Was Jesus Bipolar?" Peter Woods, I Am Listening, 2012. "Does this contrasting, pendular life of consolation and desolation make us bipolar?" Commentary, Mark 1:9-15, Sarah Henrich, Preaching This Week, WorkingPreacher.org, 2009. "John Baptizes Jesus," "Satan Tempts Jesus in the Wilderness," Michael A. Turton's Historical Commentary on the Gospel of Mark, "a complete verse-by-verse commentary on the Gospel of Mark, focusing on the historicity of people, places, events, and sayings in the world of the Gospel of Mark." "Each person has points of vulnerability to the power of evil." "First Thoughts on Year B Gospel Passages in the Lectionary," Lent 1, William Loader, Murdoch University, Uniting Church in Australia. "There is a danger is seeing any one of the three aspects of the passage in isolation. Being, without engaging the issues is remote and might evoke adoration from others but has little point. Struggling, without a sense of identity in being and doing becomes floundering. Doing, without being and struggling with the underlying issues becomes activism. And 1:16-20 adds: and don?t go it alone!" "As I think about times when my faith has been tested/strengthen, often the best service that others can do for me, is to let me share the experience. Perhaps that is why this event is followed with Jesus' first public announcement. Maybe there is a connection between the Holy Spirit leading into times of testing and the Holy Spirit speaking through us. This text might lead to some autobiographical sermons." Join the Feast, Mark 1:9-15, Jessica Tate, Union PSCE, 2009. "Despite our turning away, despite our refusal to accept God?s invitation to closeness, God still pursues us." "Assuming most of us were baptised as hapless infants, have we grown into that baptism? Let it really happen to us?" "Breaking the Boundaries," Preacher's Magazine, 2006: Listening to the Text, Engaging the Text, Preaching the Text. "Walking in the Wilderness," Sharron R. Lucas, Stewardship of Life Institute, ELCA, 2009. "According to Mark, Jesus came out of the wilderness and entered into public ministry. We, too, can emerge from the wilderness and walk into the world ready to serve and be the hands and feet of Christ." Wellspring of the Gospel, Lent 1B, Catherine McElhinney and Kathryn Turner, Weekly Wellsprings. "Have you ever been in a deserted area at night? What dangers did you feel in that 'desert?'" Mark 1:9-15, in Austin Presbyterian Theological Seminary's An Exegetical Study of the Common Lectionary, coordinated by Prof. John E. Alsup, features rough translation, disposition, immediate context, broader context, hermeneutical bridge, and contemporary address. "We seem to travel through wilderness after wilderness in these complex days. At least in this country, among those whom I observe, they say their lives are in shambles and they live and/or work (as if) in a jungle." "Jesus' Baptism and Temptation," Rev. Bryan Findlayson, Lectionary Bible Studies and Sermons, Pumpkin Cottage Ministry Resources. Includes detailed textual notes. "John the Baptist," "Baptism of Jesus," "Temptation of Jesus," "Mark 1: John the Baptist," "Mark 1: Jesus' Baptism and Temptation," wikipedia. Craddock, Fred, "Test Run," The Christian Century, 2003. Dana, MaryAnn McKibben, "'Scared Movement': An Introduction to the Lenten Texts," Journal for Preachers, 2006. Enniss, P.C., Jr., "Stewards of Our Mistakes," Journal for Preachers, 1988. Gibson, Jeffrey B., "Jesus' Wilderness Temptation according to Mark," Journal for the Study of the New Testament, 1994. Heil, John Paul, "Jesus with the Wild Animals in Mark 1:13," The Catholic Biblical Quarterly, 2006. Morse, Christopher, "The Temptations of Jesus," The Living Pulpit, 1992. Mouw, Richard J., "Baptism and the Salvific Status of Children: An Examination of Some Intra-Reformed Debates," Calvin Theological Journal, 2006. Taylor, Barbara Brown, "Four Stops in the Wilderness," Journal for Preachers, 2001. Wells, David F., "Holiness: Baptism," The Christian Century, 2000. Willimon, William H., "Vocational Temptation," Theology Today, 1995. "Angels in the Wilderness," the Rev. Talitha Arnold, Day 1, 2015. "Where to Begin?" the Rev. Christopher Henry, Day 1, 2012. "Back to the Wilderness," 5 March 2006, Luke Bouman, Göttinger Predigten im Internet: Every Sunday Sermons based on the RCL by a team of Lutheran theologians/ pastors. "Breaking the Boundaries," Jim Fitzgerald, Preacher's Magazine, 2006. "Isadore Isaac Isin," "Satan Sunday," "Sugar Cookies, Ice Cream and Popcorn," Sermons from Seattle, Pastor Edward F. Markquart, Grace Lutheran Church, Seattle, Washington. "Stopped In Your Tracks," L. Gregory Bloomquist, Saint Paul University, Ottawa. "The Apple of My Eye," the Rev. Rosemary Brown, Day 1, 2000. Worshiping with Children, Lent 1B, Including children in the congregation's worship, using the Revised Common Lectionary, Carolyn C. Brown, 2015. "Storypath Lectionary Links: Connecting Children's Literature with our Faith Story," February 8, 2015, Union Presbyterian Seminary. 2012. The Baptism of Jesus, Dianne Deming, Children's Sermons Today, 2012. "Time in the Wilderness," Mother Anne Emry, Sacred Story, 2012. Includes activities, children's church plans. "Jesus' Baptism and Ministry," "The Temptation of Jesus," "Fishermen Who Became Fishers of Men," Illustrating the Story (lessons, children's sermons), coloring pages, activity sheets, crafts, children's songs. MSSS Crafts. "Extra! Extra! Read All About It!" Charles Kirkpatrick, Sermons4kids.com. "Jesus Is Baptized and Brings the Good News," Sunday School Lessons: Family Bible Study, art projects, music, stories, etc. 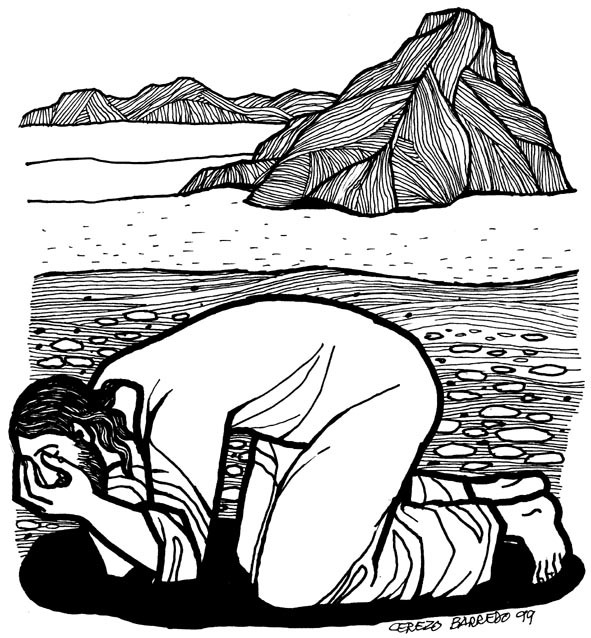 "Baptism in River Jordan," from A Certain Jesus by Jose Ignacio and Maria Lopez Vigil. Ideal for catechetical and liturgical dramatization of today's gospel. Claretian Publications. Clip Art Images: Mark 1:9-15, Temptation of Jesus, Temptation of Jesus #2, Misioneros Del Sagrado Corazón en el Perú. Mark 1:9-15, at Cerezo Barredo's weekly gospel illustration. Liberation emphasis. "Down by the Jordan," a new hymn by Carolyn Winfrey Gillette, United Methodist Church General Board of Discipleship. Hymns with Scripture Allusions: Mark 1:9, 13, 14, 15. The Cyber Hymnal.